The drawing board is the place to go for fresh starts without the burdens of physical or budget constraints. For Walt Disney World, and Disney attraction creation as a whole, this is often the place where grand ideas take shape, some that see the light of day and others that are stored away in cabinets. There is, of course, that amazing middle ground where an idea from the drawing board becomes the seed that germinates into a wonderful attraction, far different than the one planned. 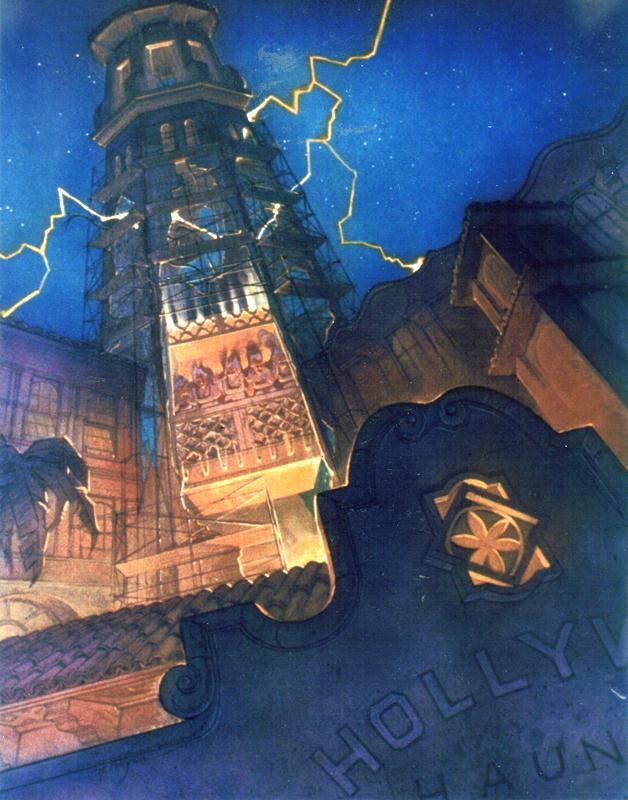 By 1991, a haunted hotel elevator was on the drawing boards as part of the expansion of then Disney-MGM Studios. The hotel would be situated on Sunset Boulevard and be a Disneyfied version of the popular drop rides where guests are hoisted up hundreds of feet into the air and then sent plummeting back down towards earth. Obviously, this would not be your ordinary drop ride. Even in 1991, the ride had been given the moninker, Tower of Terror, but there was no attachment to The Twilight Zone as of yet. The 1991 plans called for a 130 foot drop, which did come to pass in the final version. Other elements, however, were definitely tweaked along the way. From the artwork we can gleam a couple of interesting tidbits. There was going to be scaffolding all along the tower of the hotel, whether this was for repair of a damaged hotel or during the hotel’s now discarded construction is anyone’s guess, but my mind tends to hang around the damaged aspect. The sign for the hotel, while not seen in its entirety, gives clear indications of the words ‘HOLLYWOOD’ and ‘HAUNTED.’ Lastly, and most intriguing to my mind, do you see the guests crashing through the elevator shaft? Notice anything odd? That’s right, they have shoulder harnesses and appear to be standing up! While it could just be a trick of the imagination, it is interesting to think of the Tower of Terror as a ride experienced while standing. I’m sure we can all remember the television spots when The Twilight Zone Tower of Terror first launched, or during subsequent upgrades, where guests are shown in the elevators standing up and then dropping, leaving behind a floating pair of mouse ears, but this was never the reality of the attraction. For those who wonder what the attraction could have ended up looking like without the influence of The Twilight Zone, look no further than the Tower of Terror situated along the American Waterfront of Tokyo DisneySea. In this version of the attraction, a curse figurine terrorizes an abandoned hotel; still creepy, still effective, just without the lineage of The Twilight Zone. In the end, Disney’s Hollywood Studios, then Disney-MGM Studios, received a marquee attraction in 1994 that would be copied the world over. Not only did The Twilight Zone Tower of Terror bring more thrills to the park, but it also gave Disney-MGM Studios a substantial tie to the history of American television broadcasting, an avenue just as critical to Hollywood as feature films. Nice post - great to see how far and how close a realized attractions ends up with respect to these blue sky sketches. I also wanted to second your take on DisneySea's version. I was thrilled to get a chance to ride myself, and I ended up with a similar, 'not better, not worse, just different'. I have to say, the thoughtfulness of the Harry Hightower and the cursed idol far exceeds that of the previously familiar Twilight Zone branding - but once the ride starts the execution is all but identical. Orlando, with its 4th dimension dark ride scene, remains my favorite of the 4 versions.